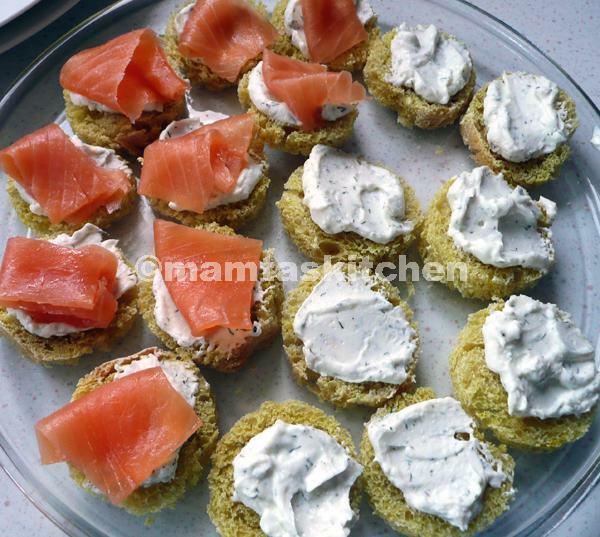 These are easy to make, delicious canape to serve with drinks. Here I have used cream cheese but if you don't have cream cheese, grind some paneer and add a little lemon juice and salt to it. Makes enough for about 6 people. Cut bread slices into small circles using a pastry cutter. Toast in a cool oven, say 150C, for about half an hour or longer. This makes them crisp, without browning or burning them. Mix all topping ingredients in a bowl. Spoon equally onto each bread circle and spread roughly. Top with a small piece of salmon. Cover platter with cling film and chill. If you do not cover them, the bread gets soft. Canape are small bites of food on crackers or slices of toast. You can use other fish or vegetarian toppings.